Synopsis. Inspired by the true story of a Norwegian valley that never sees winter sun, Kingdom (a play about Snow White and climate change) traces a hundred years of environmental hubris, including attempts to split atoms, tame a waterfall, and transmute air, culminating in a radical act of community as an artist conducts sunlight onto town square. Kingdom presents history as a parable, focusing on a blind girl who thrives in darkness and the personified conflict between natural history and unnatural selection. 4W, 4M. Kingdom was developed at the Tennessee Playwrights Studio and had first staged reading at the TPS Festival at the Darkhorse Theatre in Nashville on November 25, 2018. Directed by Leah Lowe. 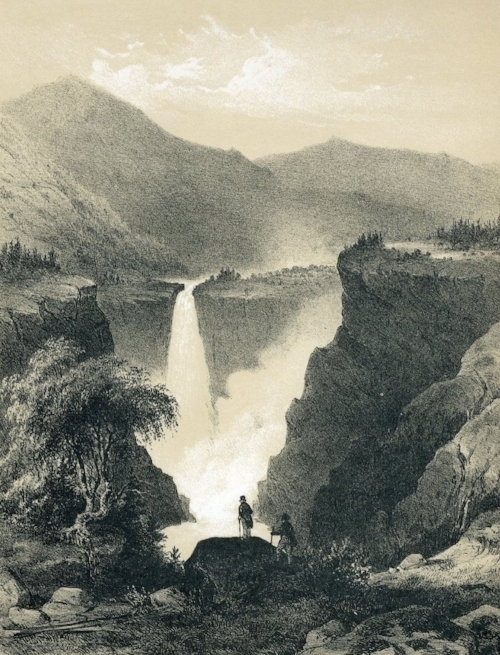 Gustav Adolph Mordt, illustration of Rjukanfoss/ Tellemarken (1848).